Today’s recipe is from Noteworthy, a Collection of Recipe from the Ravinia Festival. I found the book in our condo building’s library where someone had donated it. So special thanks to the mystery book-giver, and I can assure you it’s found a good home. 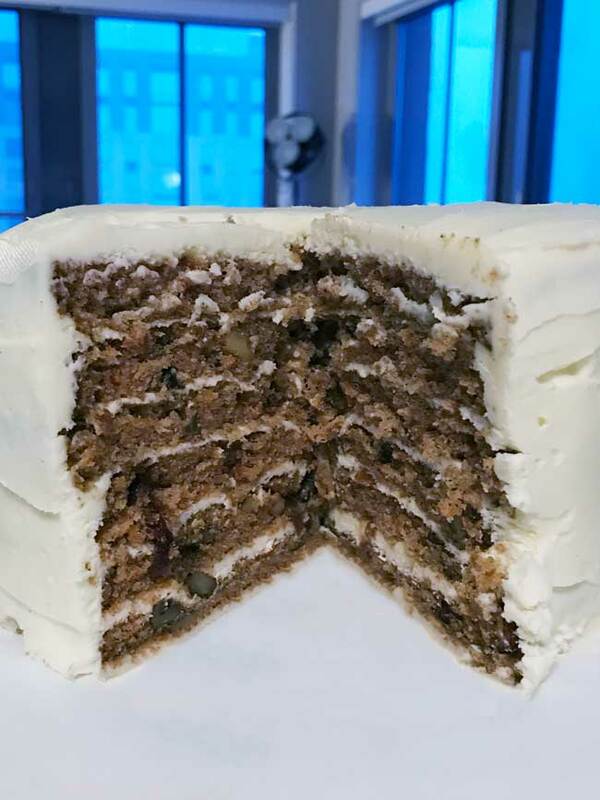 I’ve already made two things out of it — something called Judges Artichoke Fettucini and this Six Layer Carrot Cake. 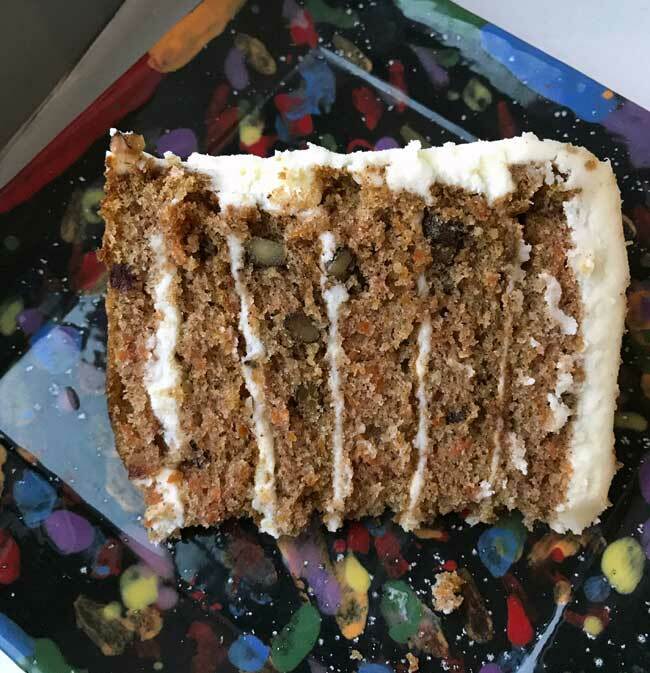 I don’t have much to say about the fettuccini (though it was pretty good), but I have a lot to say about the carrot cake. As mentioned, it’s six layers but the layers are made by splitting 3 8-inch layers so the cake is tall, but still a fairly modest size cake. It’s also very rich, so the slices can be cut very thin to feed more people. The mixing technique is also a little different than most carrot cakes in that it calls for for beating the eggs and sugar until thick and lemon colored and gradually adding the oil. This technique emulsifies the egg mixture, which as I read in Cook’s Illustrated, keeps the oil in tiny bits so that it disperses throughout the cake rather than sinking to the bottom causing sogginess. It really seems to have worked because this cake wasn’t at all soggy. The only issue was that I ran out of frosting before the cake was fully frosted and had to make another half batch. I don’t think I was overly generous with the frosting, but I did leave out the pineapple so maybe that had something to do with it. The frosting is great! It has more butter than most cream cheese frostings so it is very rich, but it’s not too sweet. It also seems to hold up at room temperature better than the more cream cheese heavy frostings. 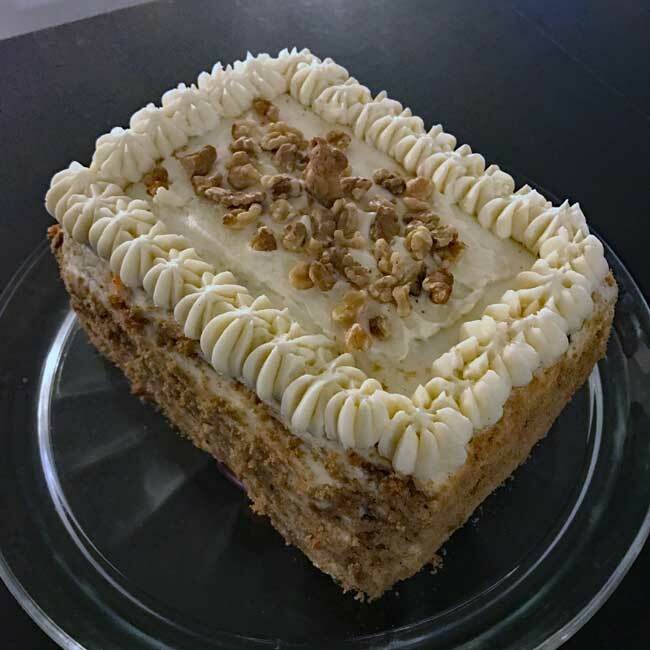 I always refrigerate or freeze cream cheese frosted cakes, but I left a few pieces of this cake out and was pleased to see the frosting did not break down. 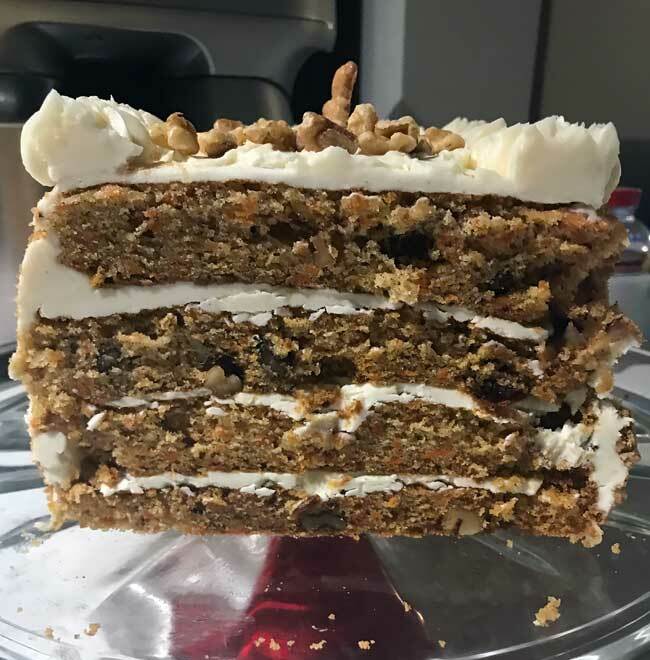 Overall this was a very good carrot cake and I’m looking forward to making it again once we finish this one. The 8 inch layers weren’t too difficult to slice, but just for fun I might try the Cook’s Illustrated’s method of making it in a half sheet pan, cutting it into four quarters and stacking. I’ll post the results here when I try it. Here’s the cake baked in a half sheet pan (bake time was about 28 minutes), divided it into 4 rectangles and stacked. I’m glad I tried it, but it’s easier to just make the 3 layers in 8 inch pans and split them the best you can. This cake, no matter how many layers you make it, would make a great ice cream cake because the oil keeps the cake from freezing rock solid. 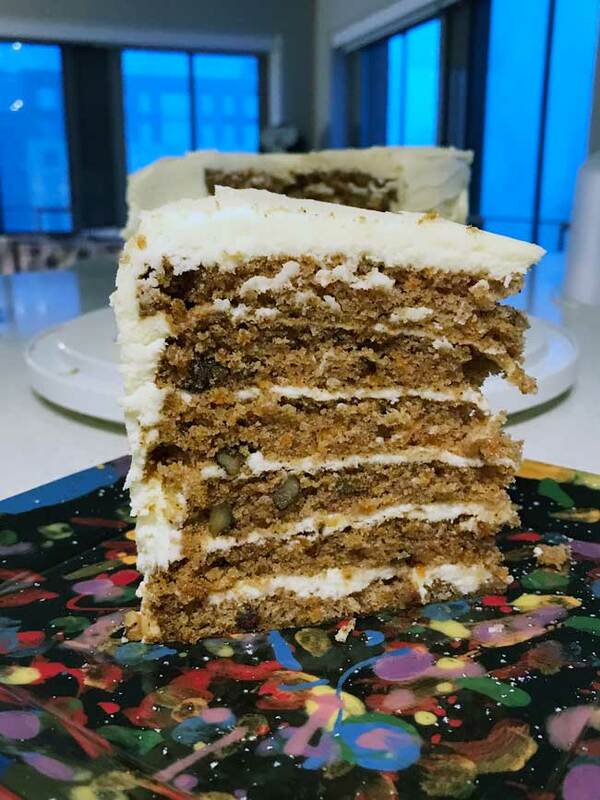 Six Layer Carrot Cake made in three 8-inch pan. Preheat oven to 350 degrees F. Grease and flour three 8-inch round cake pans. If you want you can put rounds of parchment on the bottom of each pan and grease the parchment. In a large bowl, whisk together the flour, baking powder, baking soda, salt and cinnamon, making sure all ingredients are very evenly distributed. This is very important because unevenly distributed baking soda has been known to cause carrots to turn green. In the bowl of a stand mixer using the whisk attachment, beat the eggs on medium, increasing slightly to medium high. When eggs are frothy, gradually add the sugar and continue beating until light and lemon color. With the mixer going, gradually add the oil letting it trickle down the side. Remove the bowl from the stand and with a heavy duty scraper (or your favorite mixing spoon) stir in the flour mixture until it is evenly blended. Once flour is incorporated, stir in the carrots, raisins (if using) and nuts. Divide the batter among the pans. Each pan should get a little over a pound of batter. Bake the cakes for about 30 minutes, allow them to cool for 10 minutes in pan, then carefully loosen and turn from pans to cool completely. Prepare the frosting. In the bowl of a stand mixer beat the room temperature butter and cream cheese until fluffy. Add the confectioners’ sugar and beat until creamy, then beat in the vanilla. If desired, add 1 ½ cups of pineapple. When cake has cooled completely, cut each layer horizontally so that you have six layers. Frost and fill with the cream cheese frosting, then chill cake for about an hour before serving. Not planning on doing such a large cake soon but YouTube has a videos demonstrating the technique. Thanks Cheryl! That’s an interesting way to serve cake. Not planning on doing such a big cake soon but YouTube has demonstrating the technique. Hope this link gets it to you. Cheryl, I’d love to see a picture of that. I found the easiest way to slice a tall round like that is to cut a 3 or 4 inch circle in the center than make cuts around the cake giving a wedge piece that is both more manageable to serve and as a cake serving size. You still have the 6 beautiful layers. Wow that looks so good!!!! Yes, it will only be four layers. I liked the six layers, but four will do. And I was thinking the pineapple would be weird in the frosting, but now that I’ve made it without and know the texture of this frosting, the pineapple might actually be good if drained and dried really well. That is a really impressive looking cake! If you made it in a half sheet pan it would only be four layers right? I’m glad you left the pineapple out of the frosting. I always think that is weird in frosting.